The purpose of our Money Back Guarantee scheme is to give you comfort that you will get a return on your investment, because we are confident that you will should you follow the program and adopt some key performance improvements that are recommended. Of course, there needs to be fairness on both sides, and all we ask is that you give whichever ‘Business Success’ program you select a fair chance of achieving a result. Hence the threshold for you to effect our Money Back Guarantee is after 12 weeks. If at this time you do not feel you have received value for money you merely have to return a completed Cancellation form, which you can obtain by clicking here. This must be received by us within 21 days of the release of the 12th weekly training video. This can be sent by e-mail or by ‘Signed For’ recorded post to our trading address. Upon receipt we will process your refund of instalments without quibble. 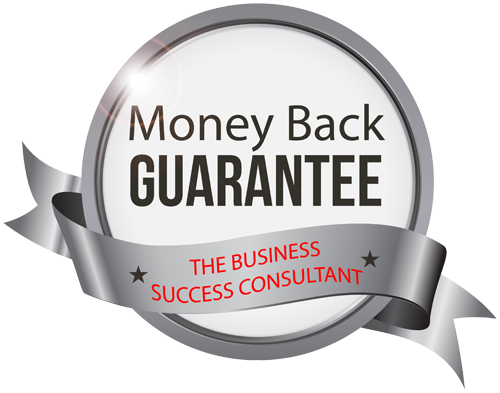 Please bear in mind our Money Back Guarantee relates only to ongoing monthly subscription ‘Business Success’ programs. It does not relate to other online courses, ‘Taster’ packages or ‘Continuation’ programs (that operate after an initial trial). There is only one condition. If you are unhappy in any way with our service, advice or systems you tell us so that we can we put things right if necessary for others, but you must not discredit our service, Company or any employee in any way to any third party. This is our only stipulation, which if breached would result in revocation of our goodwill gesture of your money back.